Pictured oak with Rich FC 19093 Dark Knight finish. - Heavy duty with powder coat finish crib spring is included with each crib. The Berkley Convertible Crib is built to last, and its ingenious design keeps it functioning after your little ones are finished sleeping in cribs. This solid wood heirloom baby crib converts into a toddler bed or a cushioned bench so you can keep using it as your children grow. Your child deserves a beautiful crib that will grow up with it. The hand crafted Castlebury Convertible Crib is the wonderful choice for your growing family. The solid wood, versatile crib is a safe and secure place for your newborn child to rest at night. During the day, it is a day bed and at night it can be converted into a full bed as you wish. Complete instructions are included to illustrate how to convert this versatile piece of furniture. This solid wood, convertible baby crib is a quality long term investment for your child. This gorgeous crib balances safety features against classic style. The charming design of this cradle will be the favorite gift at the baby shower! 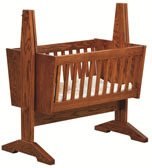 The solid wood baby cradle is a safe and secure place for your newborn child to rest at night. The Amish construction ensures this piece will withstand all of the trials your child will put it against and can be handed down. Your child deserves world-class, beautiful baby furniture that will grow alongside your family. This handcrafted French style crib is the perfect solution for your growing family. The front of the Amish baby bed has a wood panel which means your child will be secure inside of it. The solid wood, versatile crib is a safe and secure place for your newborn child to rest at night. During the day, it is a day bed and at night it can be converted into a full bed as you wish. Don't settle for a plastic or second hand crib for your child. The hand crafted French Country Crib is the perfect choice if you'd like a crib that appeals to grown-up style. The front of the crib has a pattern of wood slats so you can see your baby when they are inside. During the day, it is a day bed and at night it can be converted into a full bed when your little one gets tired. Add instant charm to your newborn’s room with the classic Hoosier Convertible Sleigh Crib. With classic good looks and sweeping design, it’s sure to conjure sweet dreams. This design is gender neutral so it can fit into any themed baby room. Your child deserves world-class, beautiful baby furniture that will grow alongside your family. During the day, it is a day bed and at night it can be converted into a full bed as you wish. In addition to its stellar construction, this convertible crib features classic Mission style design evident in the clean, parallel panel design. Let this crib help make raising a newborn a little easier. The Mission style crib will serve as a crib for a newborn, can be modified into a day bed for a toddler, and then transitions to a full size bed. Complete instructions are included to illustrate how to convert this versatile piece of furniture. 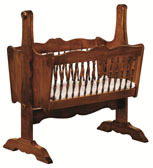 This classically styled Mission Baby Cradle is a gorgeous cradle that was designed with safety in mind. The classic design of this cradle will be beloved by everyone and withstand fads through the generations. 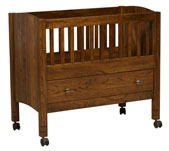 The solid oak crib is a safe and secure place for your newborn child to rest at night. The Amish construction ensures this piece will withstand all of the trials your child will put it against and can be handed down. This crib will make it position to transition from a baby’s crib to a kid’s bed. Because the crib is made out of solid wood, you won't have to worry about product recalls or deficiencies -- it's constructed with your child's safety in mind. The Monterey Mission-style crib will serve as a crib for a newborn and can be modified into a bed for a child as they get older. The solid wood, versatile crib is a safe and secure place for your newborn child to rest at night. During the day, it is a day bed and at night it can be converted into a complete bed. This crib will make it position to transition from a baby’s crib to a kid’s bed. Growing families have unique needs which is why the Amish Furniture Factory offers beautiful creation that allows you and your baby to comfortably sleep next to each other the moment your bundle of joy is brought into this world. The bassinet enables you to reach over and draw your baby close for bonding and comforting. The bassinet can be easily pulled over to an adult bed. In addition, there is a drawer beneath the child’s sleeping area for easy storage of blankets, bottles and your child’s favorite toys. Please discontinue use when your child is able to stand and pull themselves with the top bar. This wooden convertible crib will help making raising little ones just a wee bit easier. It is designed to be a crib for infants and can be adapted into beds for young children. The solid wood crib is extremely safe for children -- much better than the plastic models that are imported from other countries. The Amish construction means you won't have to worry about defects. The Shaker styling and beautiful colored wood make the West Lake line of dressers a beautiful option for any home. Shaker style furniture is treasured for its simplicity, quality and functionality. Complete instructions are included to illustrate how to convert the crib.